To cap off a year of national celebrations, the sixth and final instalment of our 'SG50 Concert Series in the Park' will be held at Gardens by the Bay on 19 December 2015. 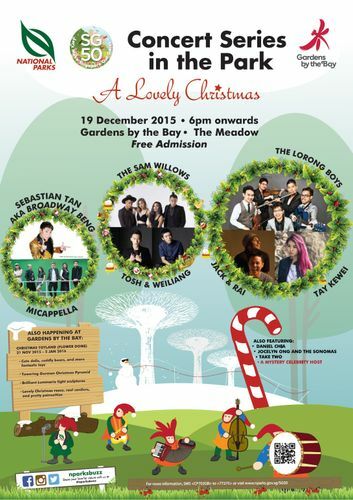 Besides Christmas songs, the stellar line-up of artistes including The Sam Willows, MICappella, Tosh Zhang, Wang Weiliang, Tay Kewei, and Jack & Rai will perform both original songs and popular covers by the likes of Taylor Swift, Maroon 5, Coldplay, Imagine Dragons, Journey and Hebe from S.H.E. Look out as well for Sebastian Tan aka Broadway Beng’s medley of Christmas hits with a local twist, specially produced for this concert. Have yourself a lovely Christmas as you picnic in the open fields of The Meadow!